LOS ANGELES — At the start of a pilgrimage last month to one of the 10 incarceration camps in California that held Japanese-Americans during World War II, an official associated with the camp was giving a speech about the need to resist President Donald Trump's policies and rhetoric. Someone uttered an expletive in protest, then said, “This isn’t political," Kathy Masaoka recalled. Masaoka said she yelled back, “This is political,” as shouting filled the room. Some in attendance angrily asserted that the space they were in, where so many of their ancestors had been forcibly relocated to after being removed from their homes, was indeed political, Masaoka recalled. The weekend-long pilgrimage to the Tule Lake Segregation Center is one of several organized trips to former incarceration camp sites that often include cultural performances, interfaith ceremonies and walking tours. The events allow third- and fourth-generation Japanese-Americans to reflect on their parents’ and grandparents’ experiences and others to learn about a period of U.S. history in which approximately 120,000 people of Japanese descent, many of them U.S. citizens, had their constitutional rights stripped based on their race based on President Franklin D. Roosevelt’s Executive Order 9066. This year, the Tule Lake Committee wove the current political climate into its programming, holding a rally in solidarity with families being separated and detained at the Mexican border. The rally look place in front of the Tule Lake jail, and attendees were encouraged to paint signs and join camp survivors and their descendants as they chanted “Kodomo no tame ni, they’re our children, set them free.” "Kodomo no tame ni" translates to “for the sake of the children” and is said to encourages others to think about and care for the next generation. For the first time, the Tule Lake Committee created a Twitter account to document the pilgrimage, using hashtags including #FamiliesBelongTogether and #StopRepeatingHistory to argue that what’s happening now is not all that different from what happened in World War II and mustn’t be allowed to continue. Tule Lake's planned disruptions weren't the first time incarceration camp pilgrimages made political statements. According to Bruce Embrey, Manzanar Committee co-chair, the establishment of pilgrimages itself was a political act. “In 1969 a group of young people, mostly ‘sansei,’ made the first trip back to Manzanar to figure out what had happened to their families,” Embrey said, referring to third-generation Japanese-Americans, the children and grandchildren of those incarcerated in the camps. We were proud to be Japanese American, and we wanted to go back to camp to celebrate this acceptance and learn more about ourselves. Fresh from the Civil Rights Movement of the 1960s, the group was inspired by the black community’s fight for civil rights and claim to their national identity, and they went off to find their own, Embrey said. “The media caught wind of it and arrived at Manzanar asking what happened, and nobody had a clear answer because they didn’t really know,” he said. In the years after World War II, it was common for family members to remain silent about incarceration, avoiding discussing the matter as a way to cope with the collective trauma they endured. Hungry to learn about what their families went through, members of the inaugural Manzanar pilgrimage deemed the site in California an important space to gather each year and unearth the history together. Embrey’s mother, teacher and community activist Sue Embrey, became a co-chair of the Manzanar Committee, where she would develop the program over the next 36 years. Others in the community didn’t feel as strongly about the decision to bring attention back to the camps, Bruce Embrey recalled. A major victory for the pilgrimages came in 1973 after aggressive lobbying from the Manzanar Committee helped earn the incarceration camp site recognition as a California State Historic Landmark. What meant the most to the community then, Embrey noted, were the words engraved on the plaque placed by the California Department of Parks and Recreation. The plaque also acknowledged incarceration to be a result of racism, as well as economic exploitation. Japanese-American families had known their imprisonment to be an injustice, but to have the state declare it as such was monumental and would play a role, Embrey contends, in empowering the Japanese-American community to seek redress and reparations from the government throughout the 1980s. Kathy Masaoka, whose father’s family was incarcerated at Manzanar and mother’s at Gila River in Arizona, was in the thick of the redress movement as a member of the National Coalition for Redress/Reparations, a group of Japanese-American citizens who demanded an apology from the government. 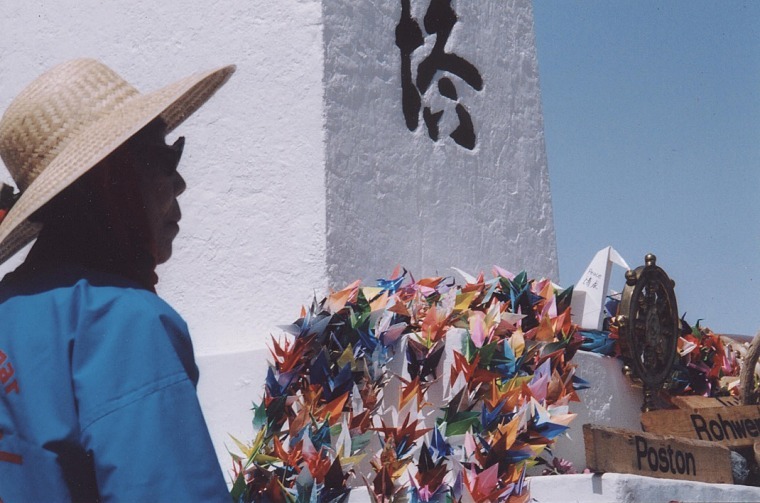 Masaoka had attended the Manzanar pilgrimage since 1971, and the coalition would use the annual event as a way to report updates on their progress as well as support for their cause. The passage of the 1988 Civil Liberties Act, which granted $20,000 to camp survivors and a formal apology from the federal government, added another layer of meaning to the pilgrimages, and attendance at Manzanar and Tule Lake increased over the 1990s, according to organizers. Pilgrimage attendance spiked again following the Sept. 11, 2001, terrorist attacks, Embrey said, though the Manzanar Committee did not keep attendance statistics until the mid 2000s. The attacks resulted in discrimination against Muslim Americans that mirrored the way the Japanese-American community was treated after Pearl Harbor, pilgrimage attendees said. Sean Miura, a fourth-generation Japanese-American community organizer and writer based in Los Angeles' Little Tokyo, was one of those mobilized into attending his first pilgrimage as a result of the attacks. He was 12 at the time and remembers his best friend’s family, who was Muslim American, hanging a giant American flag outside their home. Pictured here: Satsuki Ina in #FamiliesBelongTogether rally, at Tule Lake WWII Japanese American prison camp. Miura attended the Manzanar pilgrimage with his mom and witnessed community organizers speaking against the hate crimes and racial profiling facing people of Middle Eastern descent. Since 9/11, the Manzanar pilgrimage has invited Muslim-American groups to participate each year. The 2016 election and resulting policies affecting immigrant communities, including the travel ban and “zero-tolerance” border policy, has politically charged pilgrimages once again.